OUT! Once again lack of pace works for Elliot. Dangerous Sam Billings departs for only 2. United trembling at 64-4. Lahorion ki baduaen lag rai hain ???????????? ISLU 64-4 after 9.1 overs. برسات کے بعد ڈڈو جیسے نکل آتے ویسے بوپارہ کی بیٹنگ کے بعد کراچی والے ٹی ایل پر نکل آئے ھیں ???????? #GLADIATORS totally took control of the game. #SamBillings ka contract & paisey wapis loo & #England wapsi ka ticket pakrao isska ???????? ..! LBW! Sam Billing misses a leg-cutter from Elliot. Yaar, Monday ko paper hai, leikun BC #PSLT20 distract kar raha hai, aur upar sey meri team khel rahi hai! Famous pakistani collapse is just started , interesting thing is it's affecting aussies too.. ???????? 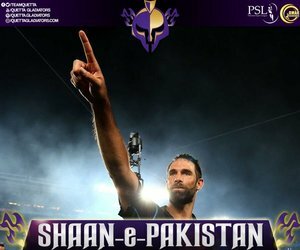 Aaj Quetta apnay bhai Lahore ka badla let ga ..... ??????????? ?